“The real deal…” is how Bill Bartolomeo of Wheels of Time described John Corson to me. He’s local, alright, right on the edge of town, working out of a two bay garage behind his house. His work is so well-known in the the not-so-local sports and racing car world that about 25 Porsche owners came for a visit. By the time they were all parked snug on John’s lawn “There was a 356 Speedster cabriolet and a 550 Spyder replicar which represented the early days of the Porsche mark for both street and track. A variety of years of the 911 model, a 928 V8, 968 models, and a few late model Boxsters. The only models missing were 914, 924 and 944.” Thanks to Allen K. Littlefield who sent me this inventory and also coordinated the visit. Then it was a chance to meet John and see some Ferraris and Porsches and hear some of his war stories. They stayed on to get to know each other better, but most of all to get to know the cars! 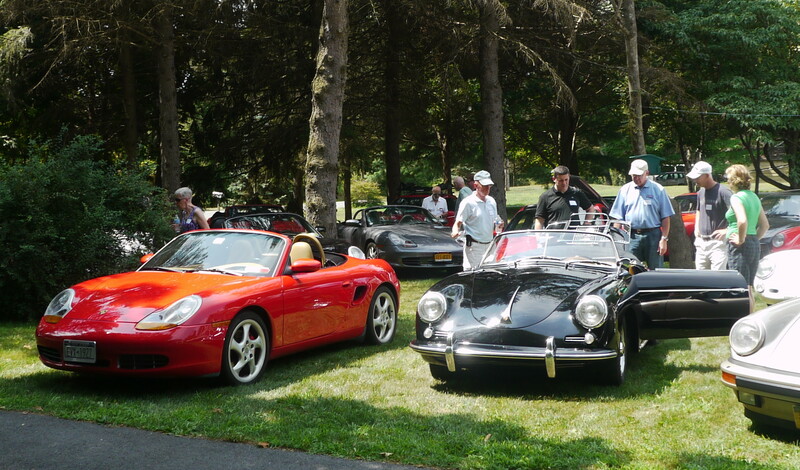 Thanks to the Hudson Valley Region of the Porsche Club of America for bringing this much fun to our town. As for me, I saw some beautiful automobiles and met some really nice people that I hope to see again. But most of all I have grown a new respect for the knowledge and craftsmanship that went into the restoration of some of these vintage machines by the people who were driving them.